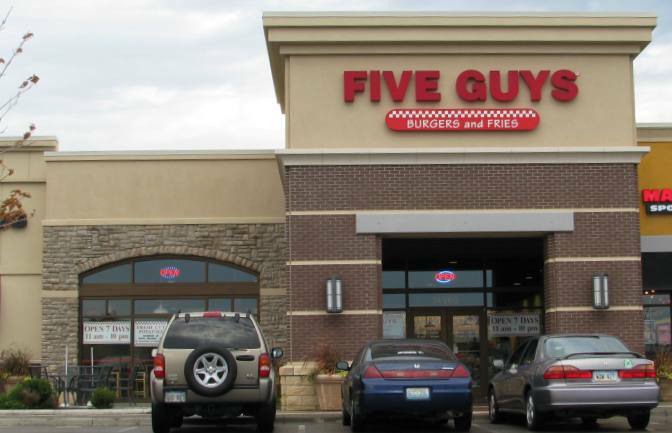 Five Guys Burgers and Fries in Olathe, Kansas serves fresh hamburgers with no preservatives, cooked to order. Toppings like grilled onions or mushrooms are available at no additional charge. The French fries are fresh and cooked in peanut oil. The servings are so large that even a big eater like me can be satisfied with a small burger and a small order of fries. Yes, this is a chain restaurant, but I think these are the best hamburgers in Olathe. They burgers are juicy, but are all cooked well done. Enjoy free, raw peanuts in the shell while you wait for your order. Five Guys does a big lunch business and the dining room is clearly designed to discourage lingering. From the noises caused by the air exchange & person calling out numbers, to the stark furnishings, and slightly two small chairs and tables everything it designed to encourage customers to hurry and get out. It takes a conscious effort not to wolf down the food. If the weather is nice, take your meal outside to one of the tables on the sidewalk. The only items on Five Guys menu are hamburgers, hot dogs, veggie & grilled cheese sandwiches, and French fires. Which is almost enough. I wish Five Guys would add chili to the menu.